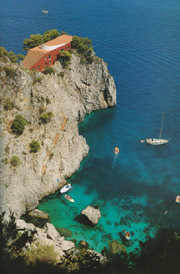 Be ready to spend a romantic afternoon in the Island of Capri. An expert skipper, with a motorboat ‘Tornado 38’, will wait for You at the harbour of Sorrento – at 5 p.m. – for drive you to this magic island, even more enchanted for the sunset light. You will have the possibility of circumnavigate the island, at the discovery of natural cave and small creek and , if you desire, you can swim to the famous ‘Blue Grotto’. A stop will not be missed at the Faraglioni rocks, three blocks of rock which have survived coastal landslides and high more than hundred metres, for a bathe in the crystalline water around the island. 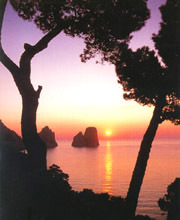 In your free time you can visit Capri’s land: the famous ‘Piazzetta’, the crowded small street or the exclusive shops. On request, is possible to book the dinner in the exclusive Restaurant “La Canzone del Mare”, a place that embodies the essence of Capri, as depicted in myth and fable old and new. Follows the back to Sorrento’s harbour.